Philip Agbese: Where are the various power probe report? We are a nation of people that easily forget. We may, however, not be a nation that easily forgive. If it seems we forgive grievous sins of past, serving and future public office holders it is down to the collective amnesia that allows those who serially raped the country to get away with their crimes. Oftentimes we end up rewarding such persons with greater responsibilities because we simply cannot recall the enormity of their transgressions against the rest of us. We forget so we endure darkness when the power sectors has gulped billions of dollars without results. We bemoan the high cost of lighting our homes as well as keep gadgets and equipment running irrespective of whether we are on post paid metering, pre-paid extortion or estimated robbery. But we forget that we are now being billed for the overpriced investment in electricity infrastructure, including the inflated value for components that were never bought. Only recently the Pharaoh of Benin Electricity Distribution Company, Mrs Olufunke Osibodu told Nigerians with glee that we have no right to expect stable electricity for another five years. We have forgotten why but we easily ignored and even immediately forgave the spewing of such poison. Afterall, this was a self styled undertaker of a commercial bank talking so we may not immediately become alarmed that Osibodu has a mandate to finally kill off a sector that years of theft has not seen off. The venue of Osibodu's dark prophecy is what should trigger the alarm bells for us. 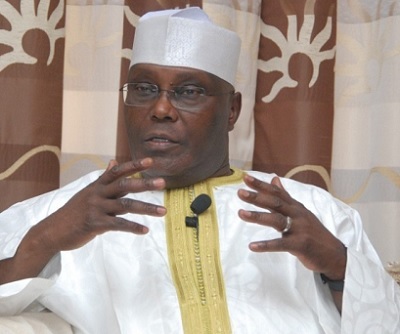 She spoke at the 11th Annual Founder’s Day event of the American University of Nigeria in Yola, which happens to be one of the many investments of a former Vice President, Alhaji Atiku Abukakar. He happens to have been the one that oversaw the privatization exercise, which had rehabilitation of electricity infrastructure before their sale as a mantra that played so continuously that it sounded worse than a broken record. What happened under Atiku Abubakar's watch set the tone for whatever brigandage was to follow under subsequent administrations. This of course is not counting any other shady dealings that were explained away as former President Olusegun Obasanjo being heavy handed on his over ambitious deputy. The cost of the prevailing darkness stands at about N6.35 trillions. Obasanjo's government in which Atiku Abubakar was basically in charge of the electricity business reportedly burnt $16bn (N3.52 trn), late President Umaru Musa Yar’Adua, who succeeded that administration spent $5.375bn (N1.183trn) while former President Goodluck Jonathan blew $8.26bn (N1.817 trn). It is instructive that the larger portion of the amount went to the Obasanjo/Atiku era. Several parliamentary probes aired on live television later, we all agree on one thing. That we have been scammed. The so called investment in the power sector only yielded darkness and the noise power generators competing with the toxic fumes they release in damaging our health and the environment. The depressing testimonies before the various probe panels may make for sensational television and dramatic headlines but we would have merely chased shadows or even worse if there are no conclusive reports that will name those who stole from us. Even if we are unable to jail the thieves that stole the money meant for creating a vibrant power sector, we would at last have reports that will name them and place their names on records. When we have records they would help us not to forget ever again what the power sector thieves did to us. With records there will be something to dust up and show to them whenever any of them try to stage a comeback. Having reports that document the way our power sector was mismanaged into the current disaster would prevent the likes of Osibodu from mounting a podium provided by a key player in the destruction of the electricity sector to hurl insults at Nigerians. She could have used the opportunity at that event to ask the founder what happened to the over three trillion naira reportedly spent in his time without result, instead she deemed it more important to accuse Nigerians of theft when they were the ones that were robbed and still being robbed. The line must therefore be drawn at this latest insult. We must be able to tell those put us in this mess that we have awoken to an uncanny capacity for recall, in fact total recall as opposed to the forgetful nation they once knew. We must therefore demand from the present government that it must dredge up the various reports into the power sector probes. All the reports must be harmonized with a view to producing a compendium as opposed to having multiple documents. For any other probes whose reports are still outstanding, those working on them should be put under the appropriate pressure to conclude and present their reports. The recommendations of those reports – from since we first having power sector probes - must be implemented to the highest level of compliance possible. Non-implementation of the reports would amount to Nigerians losing multiple times. We lost money from the public treasury, we lost when we continue to subsidize darkness in our homes, we lost emotionally from the trauma we experienced watching and reading about those probes and we will lose again if those behind these thefts are not called to account for their crimes. It is for this reason we must dispense with the meekness with which we had expected successive administration to be self propelling in dealing with the power sector thieves. Recent history teaches us the government would be perpetually bogged down by political considerations. The solution is to coalesce into groups, network as individuals or groups, or amalgamate existing groups into a critical mass that will march on the government of the day to take action. Our demands is simple. It is to ask a question. Where are the various power probe reports?